Meet me on Friday @ Friday 56 to start the weekend with Book Beginnings. Remember to post your link on Freda's Voice and to visit the other guys in the linky. And don't forget to list the title of the book and the author as well. I have this terrible habit of reading more than one (or two or three) books at the same time. I do try to stick to one per format though. 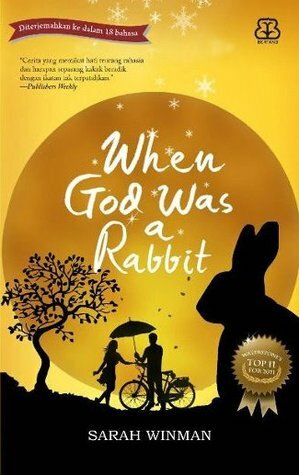 For this week's Friday 56, I will choose the paperback I am currently reading - When God was a rabbit, Sarah Winman. Jenny Penny reached across and held my hand. Her palm was slippery. I couldn't look at her. Our guilt and our tears were not for each other. They were for someone else that day. Remember to join Rose City Reader for Book Beginnings. Share the first sentence or so of the book you are reading (or just take the one you grabbed for Friday 56) and share it. As well as your initial thoughts on the sentence and your first impressions of the book. Remember to also post your link to Rose City Reader and to share the others! If you use another book as the one used for Friday 56, remember to include the title and author. This week I will use the same book as for Friday 56. Simply because there are so many beautiful sentences and passages in this book. This book reads like a memoir, told through the eyes Eleanor Maud (Elly). I divide my life into two parts. Not really a Before and After, more as if they are bookends, holding together flaccid years of empty musings, years of the late adolescent or the twentysomething whose coat of adulthood simply does not fit. I'm curious what has made them so sad in the 56. Sounds like a good read. I am interested in how the title comes about. Happy weekend! Elly (mc) had a rabbit who was named 'God' - hence the title. The 56 - they were attending a funeral with Jenny Penny's mom who was a bit of a funeral crasher. I enjoy the book! Will review when I'm done. Stay tuned. Happy weekend to you too!